A peek into the studios at The Center for Book Arts The storefront of Printed Matter, Inc. I love books. And I also love art. And, like peanut butter and chocolate, when books and art cross it makes for something even better! Think illuminated manuscripts, graphic novels, illustrated diaries, sketchbooks. . . there is something very appealing about the the combination of the written word and graphics. As well as I like the succinct presentation of art in a bound codex, allowing the viewer/reader to flip through pages, discovering multiple levels of art within one piece. In today's post I am happy to introduce two places in Manhattan each centering around book arts. The first is The Center for Book Arts. The Center for Book Arts is a multi-purpose book artist's studio, education center, exhibition space and center for resources on everything related to bookmaking. They have classes in bookbinding, printing, letterpress, paper making, paper marbling, leather tooling, typography, collage making, paper cutting, illumination, and so much more. They also host lectures on book-related topics, hold book-related events or invite guest artists in to share their work. Artists can rent studio space at the center, giving them access to all the printing and book binding equipment and supplies. There is a small gallery at the Center, with a fascinating rotating exhibit of book art. A visit to the Center offers a glimpse at the current exhibit, a small book shop offering rare and limited edition handmade art and poetry books, and a peek into the bustling studios and workshops where artists and students are busy cutting papers, stitching bindings and manning the letterpresses. Classes can run a bit on the expensive side, but it is worth checking out the schedule of events if you have any interest in learning anything related to bookmaking. 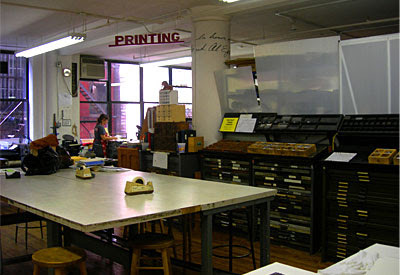 The Center for Book Arts is located at 28 West 27th street, between Broadway and 6th Ave. The other place I recently discovered is Printed Matter, Inc. This is an unusual shop on the far west side that sells rare, limited-edition and handmade books. It describes itself as being "the largest non-profit organization dedicated to publications made by artists." 'Odd' and 'fascinating' are two very appropriate words that come to my mind to describe this shop. Visit this shop to see the variety of ways printed matter can be presented, to inspire you to print and bind your own writing or to just buy an offbeat publication. 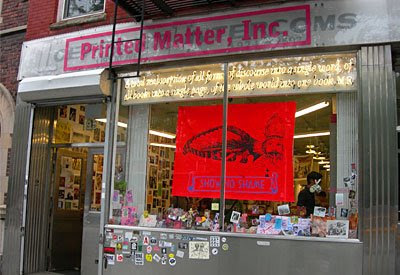 Printed Matter, Inc. is located at 195 10th Ave. between 21st and 22nd Streets. Have I Got A Bridge to Sell You!